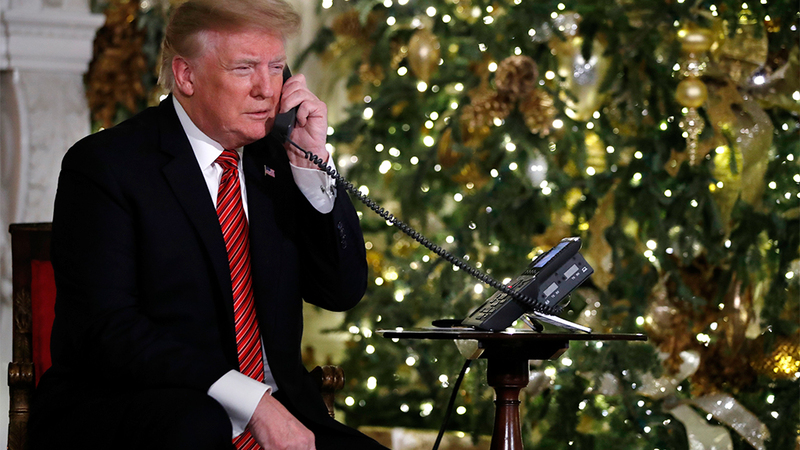 The kid who asked President Trump about his belief in Santa Claus was identified as a seven-year-old South Carolina girl who still believes in good old St. Nick. According to the post office and the courier The Collman Lloyd newspaper from Lexington, SC called the NORAD Tracks Santa program Monday at about 6:30 pm to receive an update on Santa's progress around the world. The scientist who answered the phone asked Lloyd if she would like to speak with President Trump. After about six minutes of waiting, the president came over the handsfree of the little girl. "Do you still believe in Santa Claus?" Trump asked, listening for a minute before adding, "Because at 7 o'clock it's marginal, right?" before completing the call with "You're just going to have fun". Reporters in the room with Trump could only hear his side of the conversation, and messages about the seemingly inconvenient interaction were flashed around the world. According to Post and Courier, Collman replied to both Trumps, "Yes, sir," asking questions while admitting that she had never heard the word "marginal" before. The NORAD Tracks Santa program became a tradition on Christmas Eve after a child in 1955 called for the predecessor of the North American Aerospace Defense Command and asked him to speak to Santa Claus volunteer staff at the Peterson Air Force Base in Colorado with pre-approved funding.